Today is the 14th anniversary of the 9/11 Islamist terrorist attacks on American soil. Rather than focus on all the noise and negativity, allow me a few moments of personal privilege. My oldest goes to school in NY. 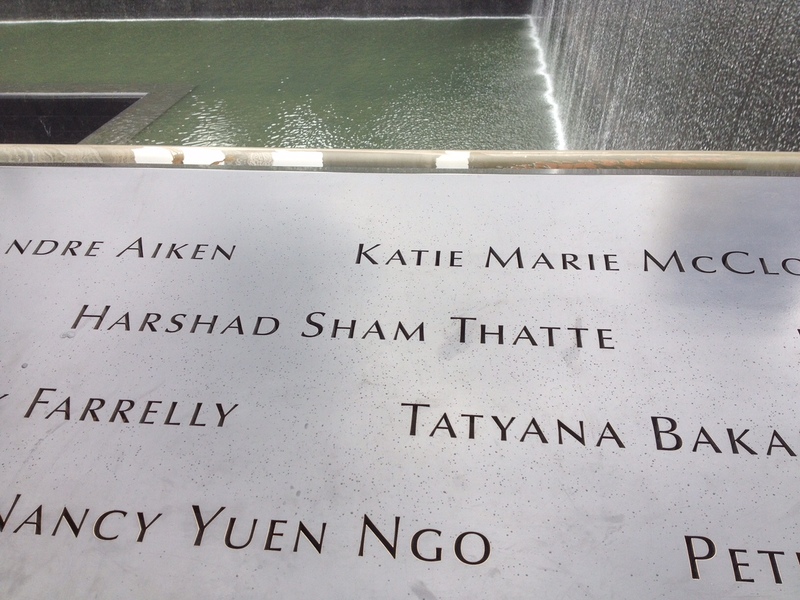 One of my “bucket items” was to visit the 9/11 Memorial before she finished her studies and moved on to greener pastures. She made it happen this summer when I traveled back with her in the weeks before her semester began. 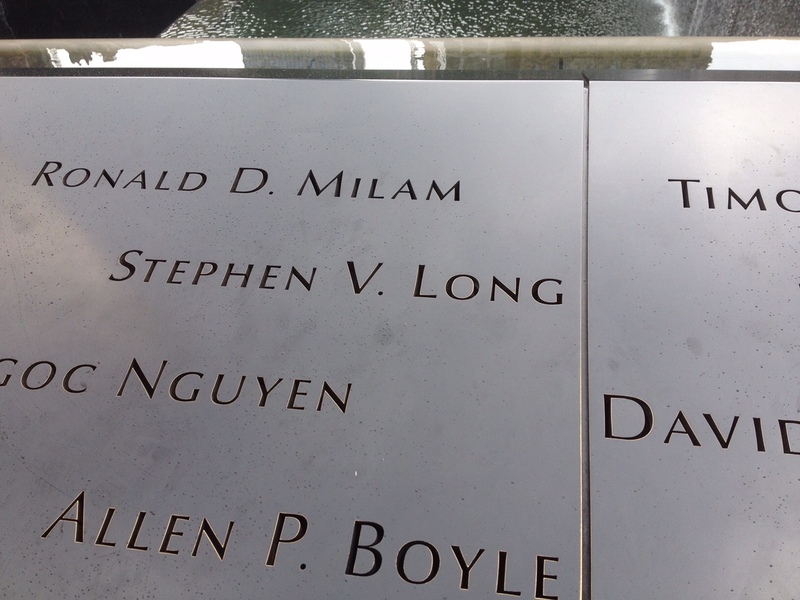 We got to the Memorial around 11am and it was already crowded and very hot/humid. I purposely found the four* Georgians killed in the attack and their names. By the time I got to Mike, the tears were streaming down my face. My daughter was just a high school freshman that fateful day. She, and those younger, may never understand the violation we felt. Not just that day, but the next, and the years to come. At 7:59 am, American Airlines flight 11 departs Boston Logan bound for Los Angeles. It never made the destination. 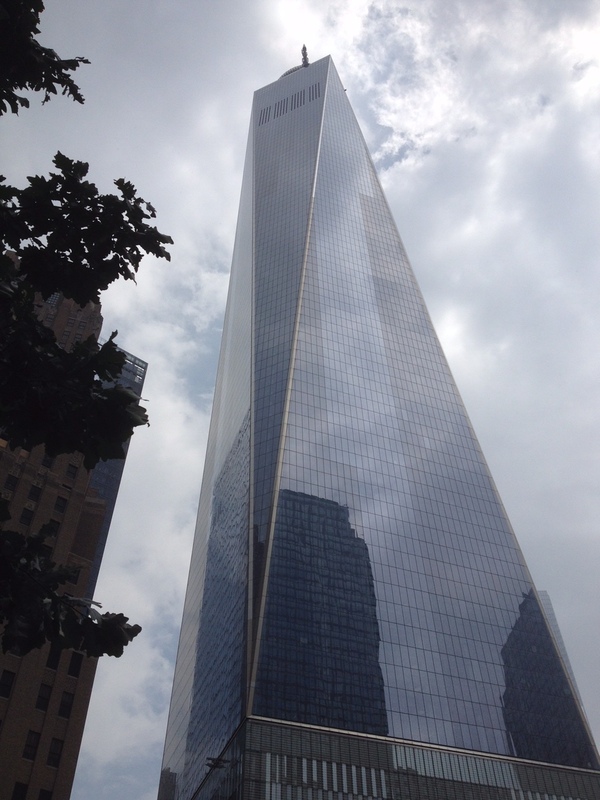 Instead, it crashed at 8:46 into the North Tower of the World Trade Center. 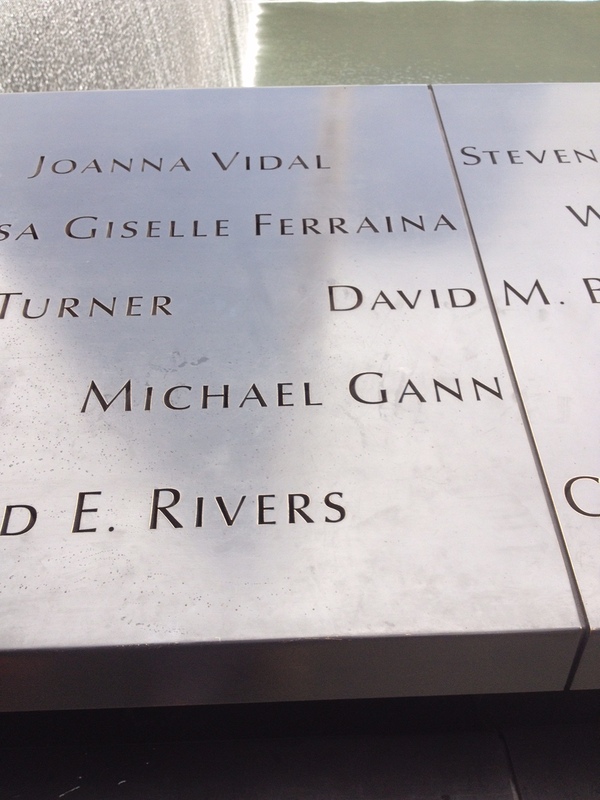 At 10:28, the North Tower collapses, killing Michael Gann of Roswell. He was attending a conference and was due to return home that afternoon. Read more here. At 8:14 am, United flight 175 departs Boston Logan bound for Los Angeles. It never made the destination. Instead, it crashed at 9:03 into the South Tower of the World Trade Center. 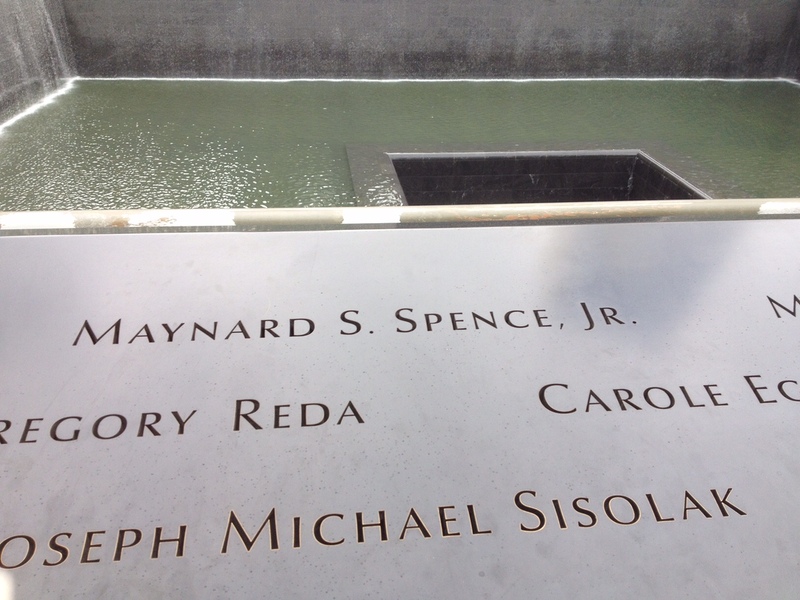 At 9:59, the South Tower collapses, killing Harshad Thatte of Norcross and Maynard Spence, Jr of Douglasville. Maynard is remembered as caring man with an infectious laugh. Read more here. At 8:20 am, American Airlines flight 77 departs Washington Dulles bound for Los Angeles. It never made the destination. Instead, it crashed at 9:37 into the Pentagon, killing Georgians Maj. Stephen Long and Maj. Wallace Cole Hogan at their posts. Read more about Stephen here. Cole had startling blue eyes. Read his story here. At 8:41 am, American Airlines flight 93 departs Newark bound for San Francisco. It never made the destination. Instead, the heroic passengers and crew mounted an attack against the lunatics who hijacked the aircraft. It crashed near Shanksville, PA, taking 40 heroic souls and 4 terrorists with it. While none were Georgians, the 40 heroes who gave their lives are dear to our hearts. Read more here. Nearly 3000 people died that day during the attacks. But remember the many who died in the days and years later of injuries, complications, long term illnesses caused by exposure and devastating grief. Remember the shattered families. Children without parents. Parents without children.